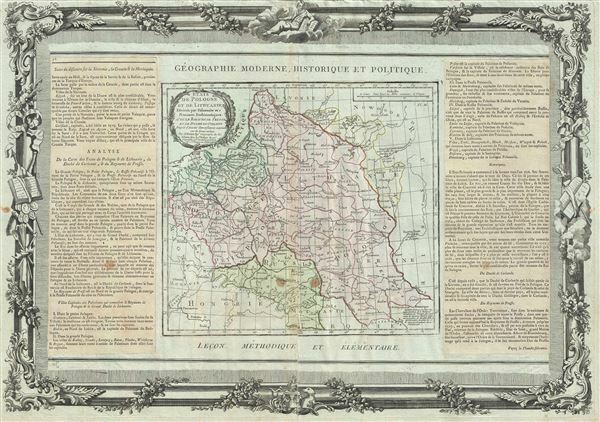 This is a fine 1790 map of Poland and Lithuania by Brion de la Tour and Louis Charles Desnos. It covers modern day Poland, Lithuania, Latvia, Belarus, Ukraine, etc. The map depicts the Polish boundaries set following the First partition of Poland. The map notes several important towns, cities, rivers and topography. Both the left and right sides of the map proper contain text and the whole is surrounded by a beautifully illustrated border. Prepared by Brion de la Tour and published in Louis Charles Desnos' Geographie Moderne, Historique et Politique. Desnos, Louis-Charles, Atlas General et Elementaire pour l'Etude de la Geographie et de l'Histoire Moderne, 1790. Very good. Some toning and wear with verso repair along original centerfold. Blank on verso. Minor foxing at places. Descriptive text mounted on either side of map, as issued by original publisher.